Question - Define the term Green Marketing; and explain why green marketing is important? The negative impact of human activities over environment is a matter of concern today. Governments all over the world making efforts to minimize human impact on environment. Today our society is more concerned with the natural environment. Understanding the society's new concerns businesses have begun to modify their behaviour and have integrated environmental issues into organizational activities. Academic disciplines have integrated green issues in their literature. This is true with marketing subject too, and the terms like "Green Marketing" and "Environmental Marketing are included in syllabus. Governments all over the world have become so concerned about green marketing that they have attempted to regulate them. Definition according to American Marketing Association - "Green marketing is the marketing of products that are presumed to be environmentally safe." According to Polonsky 1994 b, 2 - "Green or Environmental Marketing consists of all activities designed to generate and facilitate any exchanges intended to satisfy human needs or wants, such that the satisfaction of these needs and wants occurs, with minimal detrimental impact on the natural environment. 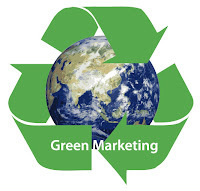 Green Marketing incorporates broad range of activities including product modification, changes to the production process, packaging changes, and modifying advertising. Green marketing focuses on satisfaction of customer needs and wants with no or minimum harm to the natural environment. Why Green Marketing is Important ? It is well known that increasing production and business activities are polluting the natural environment. Damages to people, crops, and wildlife is reported in different parts of the world. As resources are limited and human wants are unlimited, it is necessary for marketers to use resources efficiently, so that organizational objectives are achieved without waste of resources. So green marketing is inevitable. There is growing interest among people around the world regarding protection of natural environment. People are getting more concerned for environment and changing their behaviour for the protection of environment. As a result of this, the term "Green Marketing" has emerged. Hence, marketers are feeling their responsibility towards environment and giving importance to green marketing. Not only marketers but consumers are also concerned about the environment, and consumers are also changing their behaviour pattern. Now, individual as well as industrial consumers are becoming more concerned about environment-friendly products. good explanation thank you so much!